Recent rows have let to a consensus that it's time to reform many arcane parliamentary procedures. The Speaker tells LFF it's time for change - and vows to stay on. The issue of extending shared parental leave is dominating Parliament today. Yet there’s an uncomfortable irony: while politicians discuss the pressing need to increase take-up of paid parental leave, many feel put off taking it themselves. That’s because under the current ‘pairing’ system of voting – the arrangement where a pair of opposing-party MPs do not vote if one is incapable of voting – there is no guarantee that MPs unable to attend votes won’t be put at a disadvantage. The Lib Dems’ Jo Swinson discovered this to her detriment in July, when her ‘pair’ was broken during a knife-edge Brexit vote. A Tory whip forced her pairing partner to vote, despite assurances that this wouldn’t happen. Swinson – who was on maternity leave at the time – was rightly outraged. 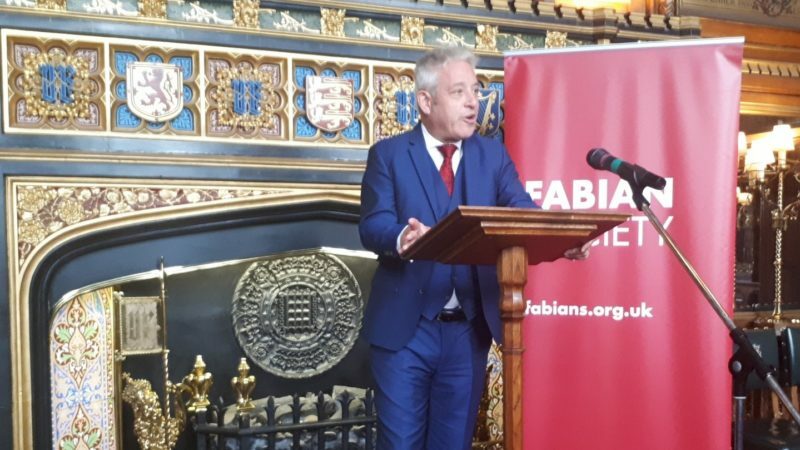 Wednesday saw the launch of the Fabian Society’s report on reforming the Palace of Westminster, New Brooms, at Speaker’s House. Among the many calls for Parliamentary reform in the pamphlet was to overhaul the pairing system. It seems like progress is on its way – with Speaker John Bercow being a leading proponent of reform. “We should never say ‘job done’. He adds that his push for reform is an effort to “try to atone for my many failures”. It’s an interesting choice of words for a man often accused of bias from Conservative benches, and who has faced allegations of bullying his own staff. The Speaker talked to Left Foot Forward after the event. But what of Mr Bercow’s own views? “I’ve expressed my own support, but ultimately it’s a matter for the House…that change ought to happen sooner rather than later,” he told Left Foot Forward. In June, the public learnt of a particularly crude Parliamentary method used to stifle backbench bills. Sir Christopher Chope – a Tory backbencher himself – caused outrage when he managed to block a planned bill to make ‘upskirting’ illegal – simply by saying ‘Object’. Surely it’s time to prevent this happening in future? “I don’t think anyone is seriously saying the power of objection should be removed…It’s not designed to stop a bill, it’s designed to stop a bill making progress without it being debated. The upskirting legislation was a Private Members’ Bill, meaning there is no guaranteed time for debate or a vote. The Bills are heard on a Friday, when most MPs are away, and there is ample scope for filibustering – ‘talking them out’ of time. Often it means they are kicked into the long grass and get no more parliamentary debate. In July Parliament agreed a new code of conduct and complaints procedure to deal with allegations of bullying and harassment of Parliamentary staff. But are they strong enough? John Bercow hopes so. “We are contracting a number of services to provide those specialist skills – the House is funding this. He praised the authors of the Fabian report, saying they deserve admiration for their work on reform. “I’m enjoying it, and I’m planning to continue for the time being. That’s certainly true – not least with the need to steer crucial Brexit legislation through Parliament. Read into this what you will, but the new Labour MPs seem to have a lot of faith in him. And there is cause for hope: with Parliament debating parental leave and the pairing system today, Leader of the House Andrea Leadsom says she will commit to introducing a system of proxy voting for MPs. The first of many wins for the reformers?